According to the suit, “Willy” follows a child discovering he has magical powers and was published ten years before the first “Harry Potter” book was published and three years before Rowling says she dreamed up the Harry, Ron and Ginny. He allegedly sent the manuscript to Christopher Little, the literary agent at Bloomsbury Publishing who went on to represent Miss Rowling, but it was rejected. 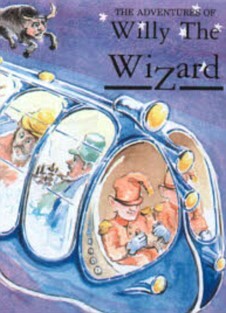 Instead his book was published by a smaller company under the title The Adventures Of Willy The Wizard No 1: Livid Land. Mr Jacobs, who lost all his money in a stock market crash in 1991, died in 1997, so did not live to see the Harry Potter books’ success. But his estate – which includes his son and grandson – now claims Miss Rowling’s fourth book, Harry Potter And The Goblet Of Fire, was plagiarised. In both books, the boy wizard competes in a magic contest. The lawsuit also notes both have the boys trying to rescue human hostages held by half-human creatures from a bathroom. Shared references to a wizard train and a wizard prison are also part of the allegations. Legal proceedings have been issued at the High Court against Bloomsbury, and the Jacobs estate also says it will file a lawsuit against Miss Rowling. The estate is also seeking an injunction to prevent further sales of Harry Potter And The Goblet Of Fire, and damages or a share in the book’s profits. Well, lets see, kids being transported to a magical world through some mundane device to where magical creatures exist. Yep, those books are identical. I’m surprised no one noticed it. I guess we’ll see the estate of C.S. Lewis is going to be getting involved in this one, too. how long has this legal suit been building? if it’s all-of-a-sudden I’d have to say SHADY but if it was shortly after the popularity of the 1st book I might not think the estate is just trying to go for a cash cow. I agree with Lejon. Of COURSE a magic world would have a magic prison. All you have to do is check the list of frequently used fantasy and science fiction plots and you’ll have lots and lots and lots of old ideas. I think the King James estate should also sue, since Harry was brought back from the dead. Exactly how many years have the Harry Potter series of books been published? Well then, guess it’s never too late to file suit! Check out my first and recently released novel, Long Journey to Rneadal. This exciting tale is a romantic action adventure in space and is more about the characters than the technology. Reminds me of a series of Comic Books that came out before either of these series called Books Of Magic. DC Comics should sue both of these people for ripping off their idea. Well, Ms. Rowling has made oodles of money and oodles of money attract parasites the way roadkill attracts vultures. You can’t copyright ideas. Yeah, JK Rowling was able to transform a 30 or so page story into a story of over hundreds of pages. Yeah, that makes perfect sense. But seriously, there is a lot more text in the HP books than the claimant’s book. I would have to surmise that some form of overlap of ideas is almost inevitable. Just because a there are a few overlaps, it doesn’t necessarily mean the two works are thoroughly and consistently similar to each other. It’s possible that both works could have drawn inspiration from an earlier source. It may just be a coincidence. Or, the similarities could have been understated or overstated. From what I know, though I’m not an expert, anti-plagiarism regulations and copyrights do not necessarily protect ideas. Rather, the expressions of ideas are protected. Ancient sources like the Iliad and the Odyssey are considered to be public domain. Sometimes, I wonder what the ancient writers-such as Homer-would think of today’s writers. Would someone like Homer consider them to be original? Imagine if the contemporary concept of Copyright existed since ancient times, and those ancient copyrights were legally binding for thousands of years.. What would writing and literature be like today? Just a thought.